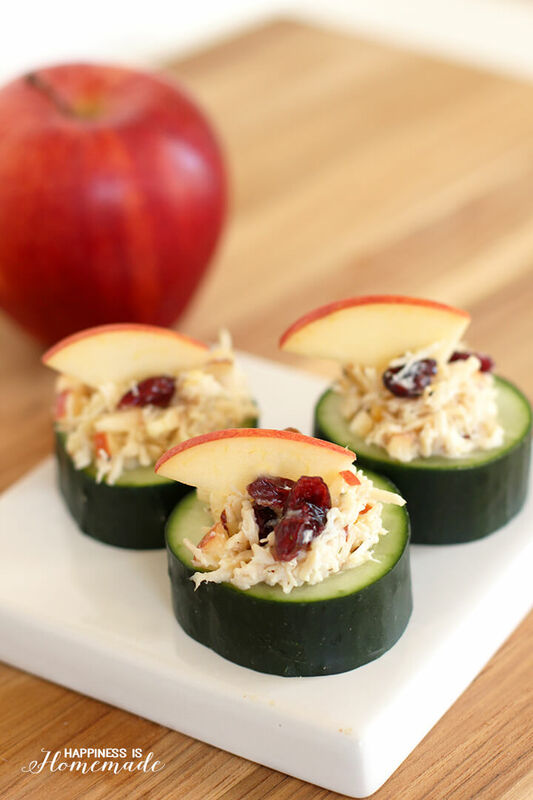 These cucumber cups stuffed with cranberry apple almond chicken salad are a great no-cook dinner when it’s too hot to turn on the oven! Also makes a great party appetizer! When it’s too hot to turn on the oven on those sweltering summer days, my go-to recipe is chicken salad filled with crisp apples, slivered almonds and tart dried cranberries. It tastes fantastic on a sandwich (or even straight from the mixing bowl! ), but my favorite way to serve it is inside of a fresh cucumber cup. Light, crisp and deliciously refreshing! Oh, and it only takes ten minutes to whip up…you can’t beat that! 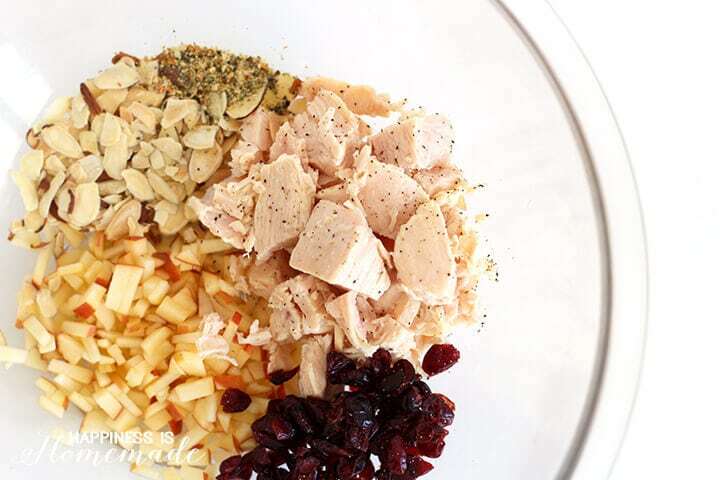 In a large bowl, mix together Hormel Foods Chunk Chicken, diced apples, cranberries, slivered almonds, olive oil-based mayonnaise, seasoning blend, salt and pepper. Next, cut the cucumber into 1″ thick slices, and use a melon baller to hollow out the center to create a cucumber cup. 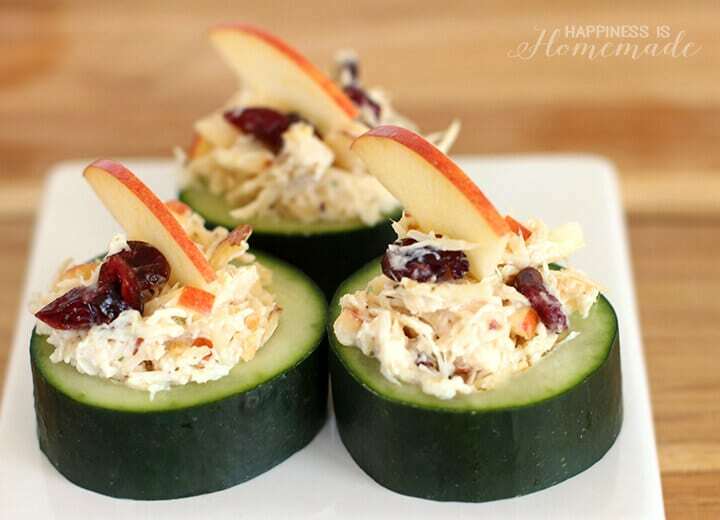 Fill the cucumber cups with the chicken salad mixture, and garnish with a thin slice of apple. YUM! 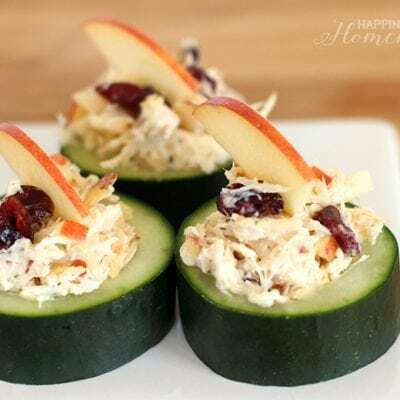 Using Hormel Chunk Chicken makes these chicken salad cucumber cups quick, easy, affordable and packed full of protein – you can’t get much better than that! 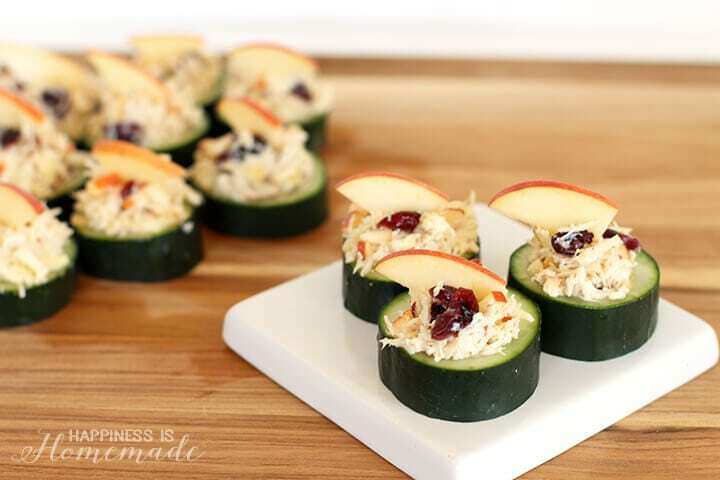 Not only does my family like to enjoy these yummy cucumber cups for lunch and dinner, they’re also a HUGE hit at parties! I served these at several recent Girls Nights Out, and they’re always one of the first things to get eaten up! My friends just can’t seem to get enough of them! 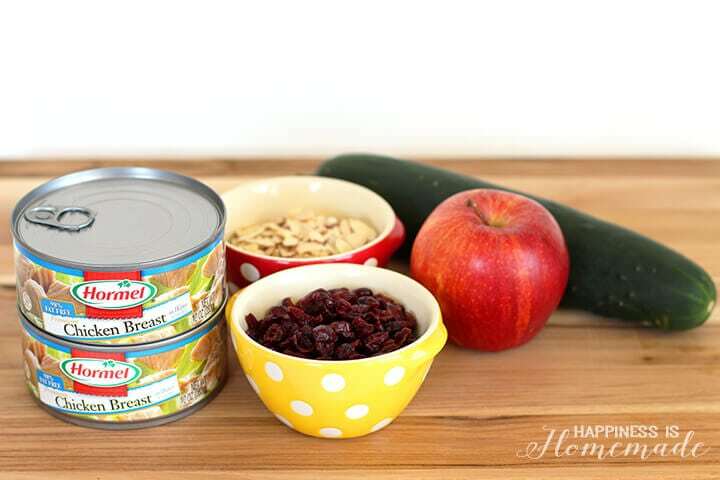 In a large bowl, combine Hormel Chunk Chicken, apple, almonds, cranberries, mayonnaise, Mrs. Dash seasoning blend, salt and pepper. Mix until combined well. 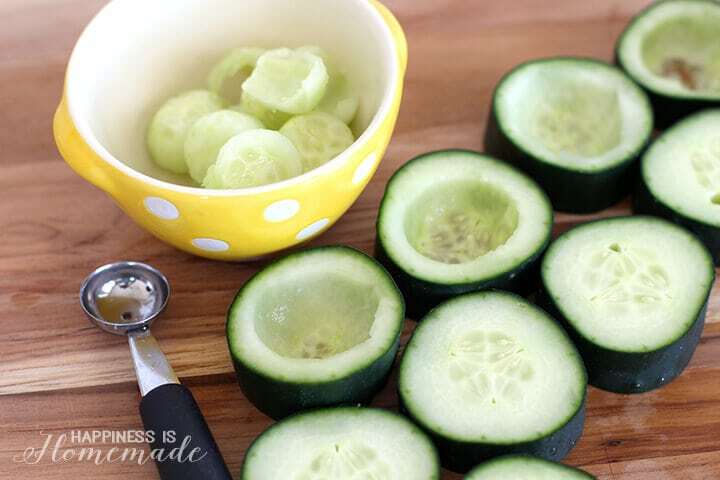 Slice the cucumber into 1" thick slices, and use a melon baller to hollow out the center to create a cucumber cup. 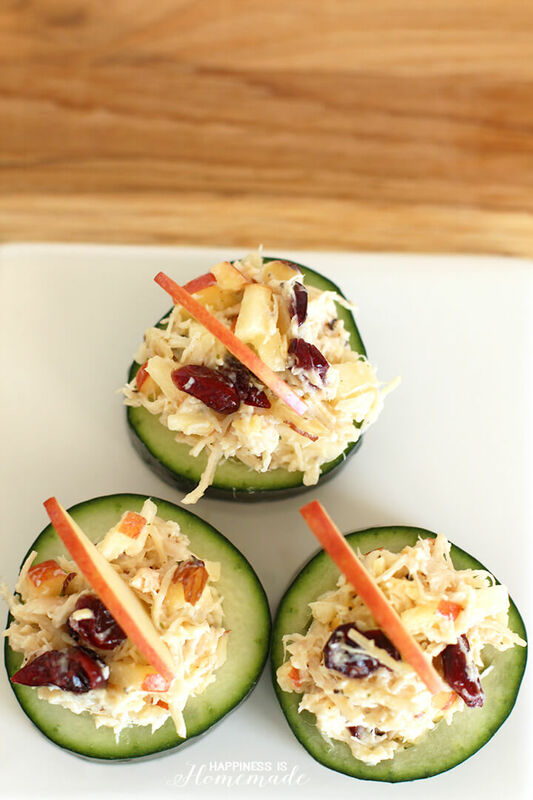 Fill the cucumber cup with the chicken salad mixture, and garnish with a thin slice of apple. For more Easy Recipe Ideas, coupons/savings, and to locate Hormel Foods products in your area, be sure to sign up for the Hormel Newsletter! « Save Money with Twined Tastemakers!